Opened on October 16, 2001. After the Crematorium in the Jewish Cemetery launched its operation it was necessary to find space for laying the ashes of the thousands of victims. A solution was found in the establishment of the Ghetto’s Columbarium in the casemates of the nearby lunette, part of assembly point XXVII of the Main Fortress. Originally wooden and later only paper cinerary urns were placed on the shelves in those premises. Access road to the Columbarium started with a passageway in the bottleneck of the redoubt of ravelin XVI, known at the time of the Ghetto as Block A III, which housed the medical library with a reading room and the Columbarium offices. It continued through the so-called dry ditch between the redoubt and the rampart of ravelin XVI to the passageway over whose gate hung the Hebrew inscription “taf-shin-dalet“, i.e. Jewish year 5704, according to the Christian tradition the period from September 1943 to September 1944. The passageway opened out into the dry ditch in front of rallying point XXVII. At the time of the so-called beautification project preparing the Ghetto for a visit of a foreign delegation, a stone pylon topped with a jug-shaped vase was erected in the bottleneck of the lunette of assembly point XXVII. On both sides of the pylon there were entrances to the covered galleries of the lunette, leading to the Columbarium situated in its casemates. A metal strip on the base of the pylon bore the Hebrew inscription “And the Lord God will wipe away tears from all faces...“ (Book of Isaiah 25,8). The space near the pylon was called the Memorial Site of the Columbarium. 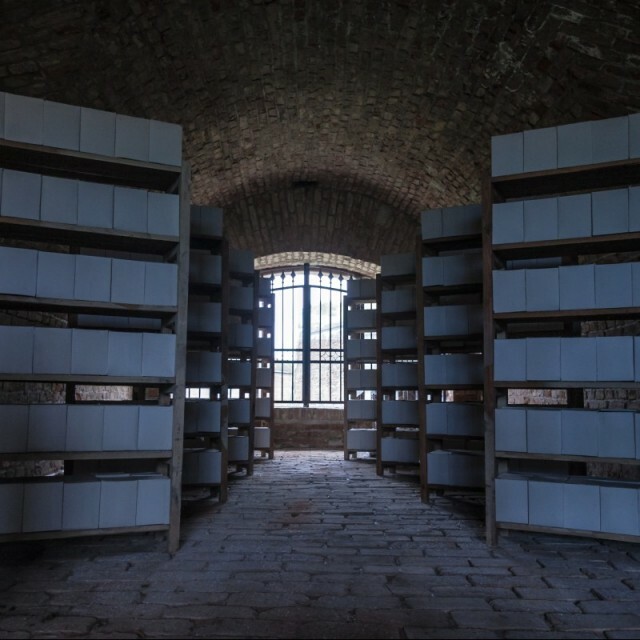 Order of the day of the Ghetto’s Self-administration on October 20, 1943 allowed the inmates access to the place, but not to the Columbarium itself. Order of the day on January 13, 1944 fixed the specific period of access to the site between 9:30 to 11:00 a.m. daily with the exception of Saturdays. During the process of covering up the traces of the crimes committed by the Nazis, the Columbarium was cleared away in November 1944, which had to be done by the inmates within several days. A smaller number of the cinerary urns (about 3,000) were buried near the concentration camp in Litoměřice and a larger part (some 22,000) were thrown into the river Ohře, while the empty urns were then burnt. For more information about the history go to the Historical overwiev.